Adware Removal Tool is a useful application, which can be used for preventing issues that are usually initiated by adware-type program. Of course, it does that by removing them from the system. This application was developed by Techsupportall team, which is especially interested in such programs and their elimination. At the moment of writing, the amount of adware-type programs, browser hijackers and other potentially unwanted programs has reached unseen levels what, we believe, was the main factor why this company decided to create such tool. If you are one of these people who have just detected adware or other PUP on their computers, you should think about such application as Adware Removal Tool. It will not only help you to fix each of your web browsers. It will also help you to remove registry traces of adwares that are usually left on computer after eliminating them manually. However, you should keep in mind that Adware Removal tool can’t be used for preventing trojans, malware, ransomwares and similar viruses. In addition, it isn’t capable of removing them from the system, so it shouldn’t be used instead of anti-virus or anti-spyware. 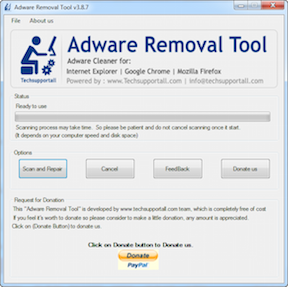 Nevertheless, this program is free of cost, so you can install it and, after you remove adware with Adware Removal Tool, you can uninstall it from your computer. Otherwise, you should know that it may start causing issues while it is working next to other security applications. While we haven’t noticed any of them while testing Adware Removal Tool scanner on our computer, we can’t guarantee that it won’t cause them on your computer in the future. Before installing Adware Removal Tool on our computers, we decided to infect them with Conduit, Adchoices and Delta-homes.com. 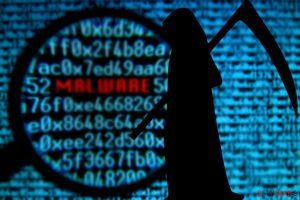 These programs are categorized as potentially unwanted programs, so they are capable of hijacking each of web browsers and then causing such unwanted activities as annoying pop-up ads, redirects, slow downs and other issues. No matter that such programs are not considered to be malicious, believe us, they can easily initiate serious havoc on your computer. So, after letting these PUPs hijack each of web browsers, we decided to download Adware Removal Tool and test its capabilities. It seems that you don’t even need to update this program before running it. You just need to launch it by clicking the “Scan & repair” button. Here, we must warn you that this program is not as fast as other adware removers, so you should be patient when you want to fix PC with Adware Removal Tool. However, after checking the system, we noticed that this program displays informative scan results on the desktop and offers eliminating each of detected objects by clicking “Repair all” button. What can be called the Adware Removal Tool’s bonus? We think that it’s a feature that allows you to leave objects that you think that are useful to you. So, if you see an object that seems important, you can leave it by unchecking pre-checked check box. So, why should I download Adware Removal Tool? To sum up, Adware Removal Tool is a great option when trying to remove adware from PC without leaving its leftovers on your computer. 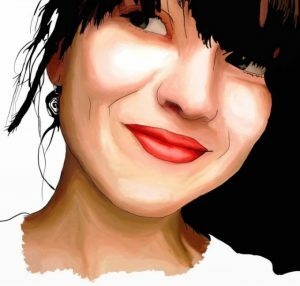 This tool is based on donations, so its cost depends on you. You can download it for free and delete stubborn adware-type programs from the system. If it does that successful, you should think about a donation. This entry was posted on 2015-05-29 at 06:39 and is filed under Anti-Spyware, Software.